Down the backstreet (Maryland Ave.) in our neighborhood is a mini-wildlife refuge that I call the Butterfly House. Few front yards offer as much foliage, and variety of it, for bugs and birds. 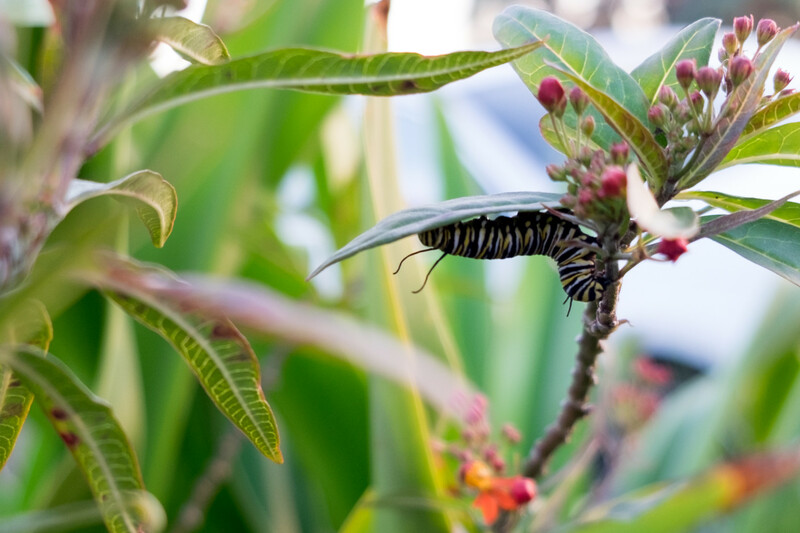 But mainstay is milkweed and other plants that attract Monarch butterflies. Two nights ago, while taking a brisk photowalk, I captured a quick pic of feline Fess. A petite, pretty runner passed by as I stooped with the camera. Later, I stopped at the Butterfly House to shoot candids of chickens, which are a new addition. Strangely, there are three domiciles, two blocks in three directions of my apartment, where residents keep the birds. The clucking makes me laugh, but I wonder why homeowners have them, and why regulation-crazed San Diego County doesn’t prohibit the practice. Is keeping hens a California thing? Back home in Maine, yeah. Sitting hidden from my view on a bench that the Butterfly House’s owners placed on the sidewalk sat the woman I spotted earlier. She spoke as I stood up to walk by, pointing out the monarch caterpillar; two, actually. I had the damnedest time seeing the squirmies and shooting them, because of light from the setting sun. This close-crop is best of the bunch. I would have missed them completely if not for her help. Photo vitals: Fuji X-T1 and Fujinon XF18-55mmF2.8-4 R LM OIS lens; f/2.8, ISO 200, 1/60 sec, 18.8mm.